We took a long weekend break in the Dales in Spring 2005, staying at Skipton Travelodge taking advantage their regular bargain £10 per night offers. 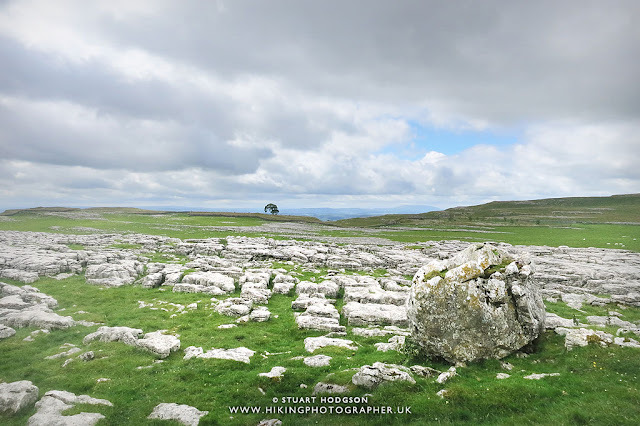 On the third day we went for walk around Malham. 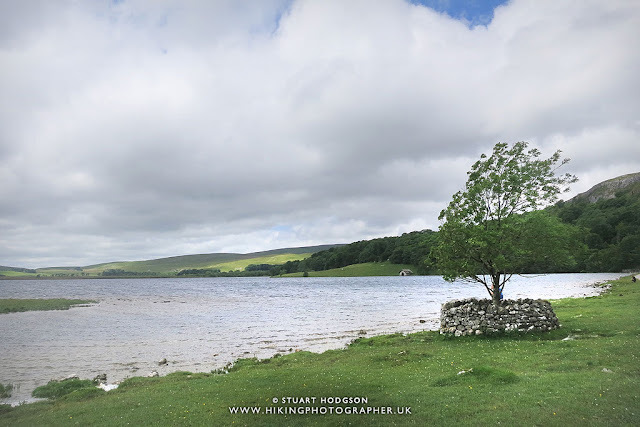 The weather was fine and sunny as arrived at the National Trust Car Park at Malham. Our 2 children aged 1 and 2 were transported in style using Bushbaby baby carriers. These are very comfortable and have good sized rucksack area underneath the seat to carry your gear which most other baby carriers lack. Our first stop was about 1 minute later when the kids spotted the ponies at the pony trekking center next to the car park. Dragging them away we then headed out of Malham on the Cove Road. Just outside the village we stopped off at Town Head Barn. This typical 18th century Dales barn has been carefully restored by the National Trust. Inside is also an interesting free exhibition about the history of farming in the area. We then headed back up Cove Road to reach the main footpath to the Cove. This delightful stretch through a beautiful limestone valley follows the bubbling stream up to the cove. Near to the cove we met a group of ornithologists who had their telescopes trained on a rare bird of prey nesting in the cove, and they kindly let us take a peek. A peregrine falcon I think it was. After examining the Cove at close range and playing spot the climber, we found a sunny patch of grass to have our packed lunch, after which we spent a while paddling and larking around by the stream. 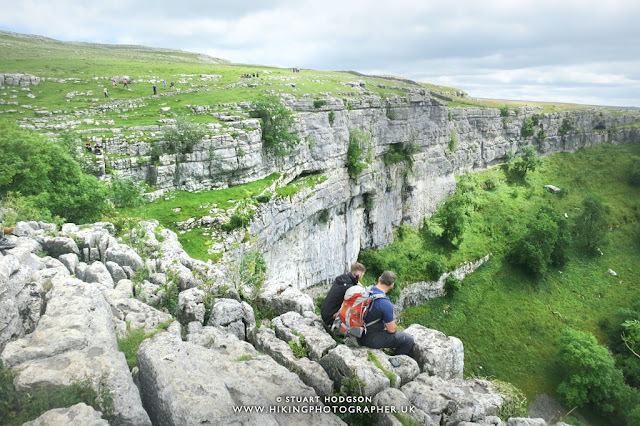 My original thought was to follow the classic route of climbing the steps next to the cove to the limestone pavement, maybe visiting the tarn, before walking over the moors to Gordale Scar and climbing down the waterfall, but this would have been far too dangerous with the toddlers on our back. So after lunch we crossed the stream and followed the alternative footpath back towards Malham though classic limestone country. 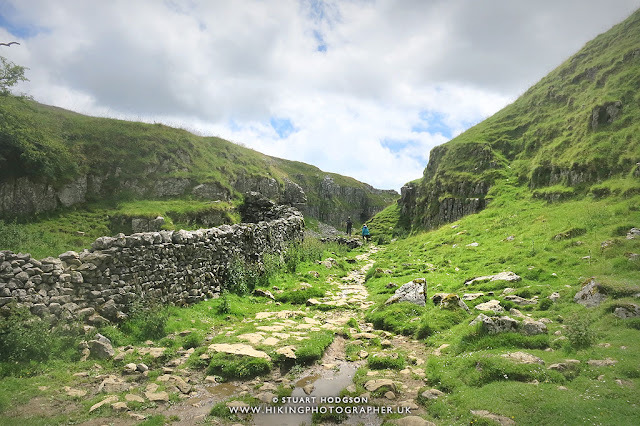 This met up with the small lane which leads to Gordale Scar. Thankfully it was a very quiet day with virtually no traffic and so walking was brisk and pleasant. 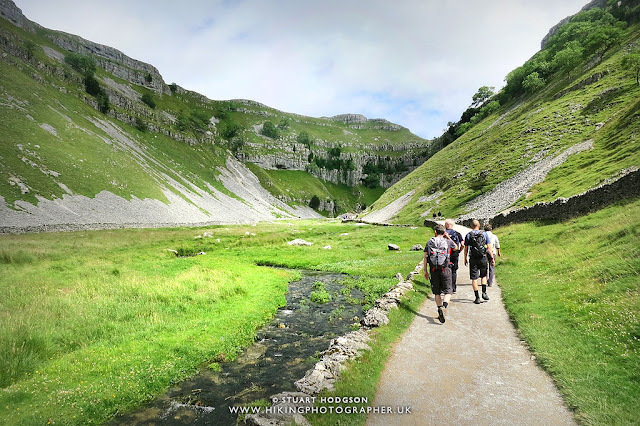 After a steep descent we joined the main footpath to Gordale Scar. This is another delightful river walk surrounded by steep cliffs which gets more and more dramatic as you approach the scar. The footpath here is a man-made shingle affair due to the amount of human traffic that passes this way. The sun was getting low in the sky as we reached the scar itself which helped produce a couple of great photographs. We climbed as high as we safely could up the scar. 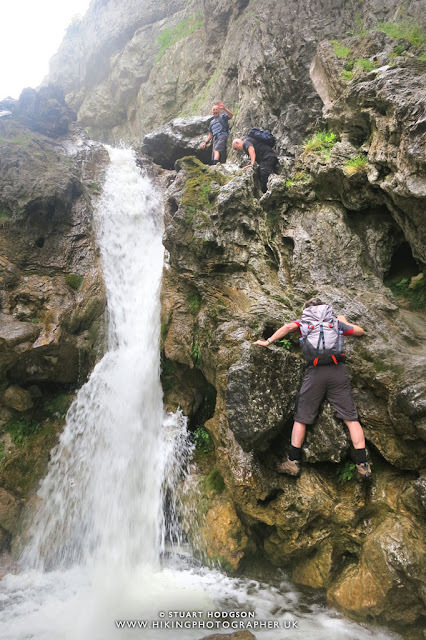 Unfortunately the weather had been relatively dry and the waterfall was not a spectacular as I’ve seen before but an exciting climax to the route none the less. After retracing the footpath back and crossing the road, we continued to follow the beck though a lush wooded valley. Here the path meanders down to Janet’s Foss, a picturesque waterfall plunging into a deep pool. It is said that a fairy queen inhabits the cavern behind the waterfall, but there was no sign of her today. The path continues down and it was during this stretch that our eldest daughter leant a new word – Garlic. The whole of the valley floor was covered with wild garlic giving the air a nice pungent aroma. We decided then and there that our starter for our meal that evening would be garlic bread! After exiting the wood the trudge back through the fields is dull by comparison, until we return to civilisation where river is met by the picture postcard scenery of Malham cottages. Before departing we had a well-deserved cuppa at the Cove Centre where we bought a picture of the local scenery that now hangs in our home. Hi Chris, I loved your description of your route. 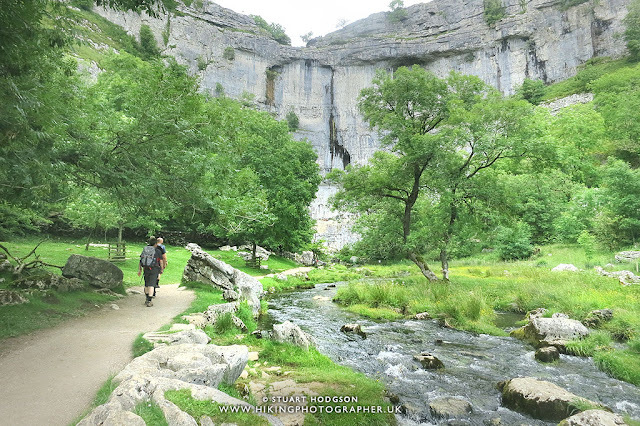 I just did a similar walk a couple of weeks ago, but I did Janet's Foss first, then Gordale Scar, Malham Tarn and Malham Cove. It was a fantastic day out! You can see some of my photos at 10000-steps.blogspot.com - I hope it's OK to mention this! 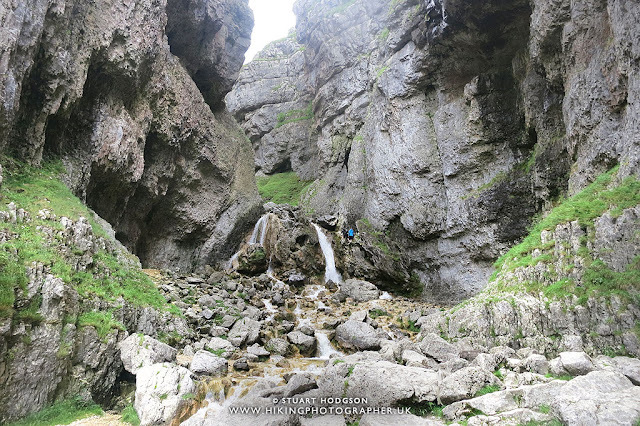 I was so pleased with myself when I succeeded in scrambling up the waterfall at Gordale Scar - literally on top of the world! Great blog, Landgirl. Sounds like you are on a mission! Enjoyed reading all this. I shall be there next Saturday. unless my plans go for a ball of chalk. Nice, been there. Think I'm too old to climb that waterfall............never did get round to it!